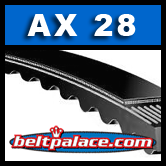 AX28 Molded Notch V-BELT. 30 inch OC. (762mm) -- Special molded notch design reduces bending stresses. For any industrial application, particularly where small or sub-minimal sheave diameters are required.